Copper Soldering Tip. Can also be used for Wood, Leather Burning and Stain Glass Work. Smoothing T.. Heavy dut, high quality Desoldering tool is efficient and durable. The tool's design and high vacu..
Gas Powered Multi Purpose Professional Tool Can be used as Soldering, Blow Torch or Hot Knife Refi..
Gas Powered Multi Purpose Professional Tool Can be used as Soldering, Blow Torch or Hot Blow Piezo..
Multi Purpose Butane Gas Tool Kit Included: 120W Butane Gas Tool Adjustable Temperature Soldering..
100 Watt 780 deg F Instant heat gun. Combined operating light & torch. 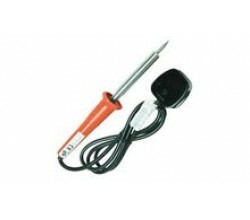 30 Watt soldering iron with.. The most effective flux known. Before starting to solder, remove all traces of rusr, dirt or oil fr..